Whether it's part of your everyday morning makeup routine, a friend's birthday bash, a holiday party, or even your wedding day, there's no denying that eye makeup, from your favorite eye shadow and eyeliner to a quick-drying mascara, adds a dash of pizzazz to your look. In fact, in a recent poll, 37% of women said that mascara is one "makeup item they're always wearing." So whether you're looking for a soft and subtle glow or a smoldering smoky look, used properly, eye makeup can be a great way to make your eyes look sharper, more open and defined. However, keep in mind that your eyes are also one of the most important (if not the most important), senses in your body. So while eye makeup can help enhance your eyes and make them stand out, it's also essential to make sure that if you wear eye makeup regularly, you know how to protect these priceless gems. Before jumping into eye makeup tips for protecting your vision, it's important to dive into a bit of history about eye makeup. Well, by understanding how eye makeup has played a prominent part in helping to accentuate the eyes for centuries, you'll realize that this is a practice ingrained in our culture, and is not going anywhere. So, if people aren't going to stop using eye makeup altogether, it's important to learn how to at least use it properly. Dated as far back as ancient Egypt, (c.3100-2907 BC), Egyptian women blackened their upper lid and lashes with "kohl," made of soot or antimony (a metalloid, naturally found in nature, which is now shown to be an eye irritant). Kohl was also made of other blends including malachite, copper and lead, and Romans were said to use kohl to darken eyelashes in the 1st century AD. In fact, kohl, also referred to as "kajal" is still used widely today, and commercially produced kohl, even in modern times, can contain "high levels of lead" as per this 2010 study. Jump to the 1800s, and women used poisonous belladonna to make their eyes glow. In fact, other harmful substances such as mercury were also popular in makeup products back then. By the 1900s women had started to make their own mascara using hot wax beads or petroleum jelly. By the 1950s movie stars such as Audrey Hepburn dictated makeup trends. Today women have endless options when it comes to choosing eye makeup, from the color choices to the brands, to the look they want to portray. So no matter how you want to portray your outer beauty, below we'll share why you should take eye makeup seriously. Generally considered safe to use, eye cosmetics are pretty much okay to use as long as you follow some common sense guidelines. For example, if you're still using a 5-year old eye shadow be aware that these pretty little makeup boxes can be a harboring ground for all kinds of bacteria and even fungus which can multiply over time. In other words, although it might enhance how you look, you're decorating your eyes with germ-filled gunk. When not used correctly eye cosmetics can cause injury to your eyes, eye infections, irritation, and allergies. In serious cases, an improper application may also damage the cornea, (the outermost layer of the eye that helps to focus vision). This can happen from improperly sharpened eye pencils or liners that can scratch the corneal front surface, causing pain and injury. Now that we've covered some of the potential dangers of eye makeup, next we'll take a look at essential eye makeup tips to keep your eyes healthy. This may sound simple but is a step a lot of people miss. Before you start your makeup routine, always remember to wash your hands. For eye makeup, if you're going to be using your fingers, perhaps to smudge eye shadow or put on some fake eyelashes, washing your hands first is a must. Otherwise, you don't know what kind of fungi and bacteria you're spreading to your eyes which can result in a pesky eye infection. Unclean brushes are truly icky. One unclean brush dipped into different tubs of makeup can contaminate all your makeup products — and then your face and eyes. Your local drugstore will have gentle soaps or makeup brush cleansers available to help you clean your brushes. How you store your makeup is also important. The best way to prolong the life of your cosmetics is to keep them in a cool, dry place. So, don't store your makeup in your car's glove compartment or in a steamy bathroom. Airtight containers are advisable or at least ensure all tubs are closed tightly, as open jars can invite dust, other contaminants or even moist air, which can be the perfect breeding ground for germs. So you love mascara...but did you know that a 2013 study investigated the use of expired mascara worn by 44 female students and showed astounding results? The study showed that 43 out of 44, or a whopping 97.9% of participants used makeup, including mascara, well beyond the expiry date and microbiological analysis of 40 mascara samples revealed that "these products have a high level of contamination with pathogenic microorganisms," such as bacteria that can cause staph infections. So, as a rule of thumb, replace your mascara every 3-4 months. If it starts to clump or smell funny, chuck it out immediately. If you feel it's a shame to waste all that leftover mascara, buy a mini tube! Just like throwing out your mascara after it's expired is recommended, the same applies to all your makeup products. Agreed, it can get expensive to buy and then toss out a half-used palette of your favorite eye shadow or that handy eyeliner that looks half full — but it can turn out to be more costly if this same makeup ends up causing a nasty eye infection. 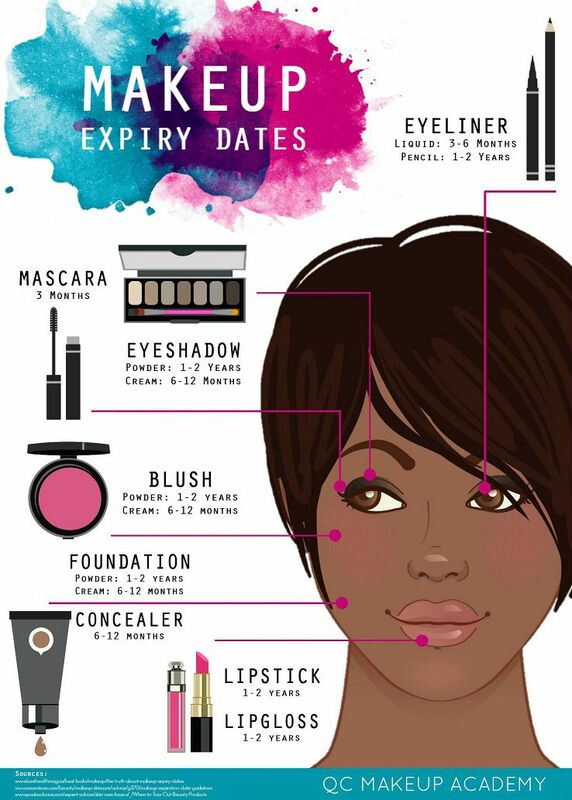 When you purchase most makeup items you'll notice a batch number or expiry date on the item, usually shown in months. This indicates that after breaking the seal, the product is good to be used within that time. So for example, if you see 12M, the product is good for a year. A good tip is to keep a permanent marker in your makeup bag and mark the date you open a new tube or jar, so you can keep track. You've probably heard of the common phrase — sharing is caring — but not when it comes to sharing your eye makeup! It may seem harmless enough, but sharing your mascara, liners, palettes, sponges, brushes, or even your towel is a big no-no. For example, borrowing a friends eyeliner or sharing your own makes you more vulnerable to contagious eye infections such as pinkeye or even conjunctivitis. If you feel compelled to share, let your friend keep it, or carry a sealed spare, for exactly these kinds of situations. Also, remember to never mix and match makeup. For example, don't use a lip pencil on your eyes, and steer clear from any eye makeup product testers at department store beauty counters! Ever had a fleck of eye shadow in your eye? This could be a real pain. That is why most health professionals recommend eye makeup that is cream based rather than powder-based, as the dust could inadvertently get in your eye. Avoid eye cosmetics filled with preservatives such as parabens, formaldehydes or BAK (benzalkonium chloride aka quaternium-15 ) which can actually be toxic to the eye. Don't use "kohl" eyeliners or pencils, as these can contain lead. Whenever you apply eyeliner or use an eye pencil make sure it is always applied on the eyelid. Eyeliner should never be applied below the eyelid or the waterline (the skin touching the cornea) of your eye. At times makeup artists will apply eyeliner this way - called tightlining — to make the eyes pop. Most standard eyeliners contain ingredients that can irritate or even infect your eye. Applying eyeliner along the waterline can risk small particles traveling into the tear film. If you wear contact lenses, have sensitive eyes, or suffer from dry eye you should be especially careful. All that glitters is not gold — especially when it comes to eye shadow or pencils! Tiny pieces of glitter and shimmer found in eye shadows can easily get into your eye, irritating the eye, or worse, scratching your cornea or causing an injury. Use water-based, matte eye creams to create a dramatic look if you must, but stay away from glittery, shiny and iridescent eye makeup. Be aware that if you wear contact lenses, you are already more prone to getting an eye infection. With lenses, makeup can travel from the eyelid and into the eye, latching onto the lens. When you remove your lenses, that tiny speck of makeup can cause a scratch, or continue to linger in the eye for as long as you have your contacts on, causing irritability and increasing your chances of an infection. There are also some precautions you should take when wearing your lenses. Firstly, make sure you wash your hands well and dry them. Drying your hands is an important step as tap water is not sterile (like contact lens solutions) and may, in fact, have contaminants that can lodge on to your lens as you put it in your eye. Also, wear your contacts after you've put on your makeup so that no small particles can possibly get trapped under your lens. There may be trends you might be tempted to follow to make your eyes pop and look 'cool,' but there's nothing really cool about them. Take eyelash extensions and false eyelashes for instance. The glue used to apply them can cause irritation to the eye. Also since these aren't your real lashes, they mess up how you blink — causing eye dryness or making dry eye symptoms worse. Certain decorative or novelty lenses for Halloween may not be safe as most are not manufactured as per the same specifications as prescription lenses. They may look fun, but it's best to resist. This seems to be common sense, but some people feel they're talented enough to apply makeup while driving. While distracted driving is risky for obvious reasons, applying eye makeup while driving or even while in a moving vehicle such as a car, bus or subway can be especially risky for your eye. A wrong move, a sudden break, or a bump on the road can be enough to poke your eye and scratch your cornea (referred to as corneal abrasion) or keratitis (corneal inflammation), posing a serious risk. Be safe and take 5-10 minutes to apply your makeup before hitting the road, or if you absolutely must, pull over on the side or do it in the parking lot. Have itchy, dry eyes? Down with a sty or conjunctivitis? From mild to serious eye infections, skip your daily eye makeup routine when your eyes are irritated, red, itchy, dry or infected, as this may slow down the healing process and introduce new problems. It's also important to keep in mind that eye cosmetics themselves may be the cause of the irritation. For those who are extra sensitive or allergic, once your eyes are healed, introduce one new eye cosmetic at one time. This will help to identify which products don't suit you or which ingredients you may be allergic to. If you feel a product is causing irritation, stop using it. More importantly, if you've got an infection in your eye, it's advisable to throw out your eye makeup and start with a new fresh batch once the infection clears up. You've had a long night. You walk into the bedroom and fall on your bed, only to wake up in the morning with eyeliner smears on your pillow...and your eyes are red and itchy too. It's important to remember that your eyes need sleep. This allows them to rest, recover and renew, and makeup can interfere with this process. Wash your hands first! Then, carefully take off your eye makeup using a gentle fragrance-free makeup remover (avoid products that contain sulphates or alcohol as they can irritate the eyes). At times eye cosmetics may come with their own removal instructions, such as removal with cold cream, warm soap and water, or makeup remover. Follow the instructions. If you wear contacts, first wash and dry your hands. Then remove your lenses before you take off your eye makeup. This will ensure no particles will latch on to your lens during the removal process. Everybody needs a break. Even though you may feel you can't step out of the house without putting on some mascara, it's essential to give your eyes a break. You can perhaps do this on a weekend when you're catching up on your laundry or want to stay in and binge-watch your favorite TV show. You can also take this day to take some time off yourself. Try a home-made facial, take a bath with essential oils, do some yoga. Going the entire day without makeup could be a great excuse to give yourself a break too! According to the American Optometric Association (AOA), It's important to at least have one comprehensive dilated eye exam (with pupils widened) every 1-2 years to prevent and catch any vision issues. If you're 60+ then you should be having one at least once a year. However, between visits, if you have started to notice symptoms such as redness, watery eyes, dry eyes, blurry vision, floaters and more — take it seriously and visit an eye doctor. At times you may be allergic to an ingredient in a certain cosmetic, or perhaps your eyes may generally just be more sensitive, or you could have an underlying eye condition. Whatever the reason, if you notice something out of the ordinary, get it checked. Can't step out of the house without your favorite mascara? Just like you take the time to make your eyes look good from the outside, it's incredibly important to take the time to make them look and feel good from the inside. Along with taking care of your diet and lifestyle, taking eye supplements is a great way to maintain and improve vision and protect against degenerative disorders that can affect the eye. You can only eat so much, so with supplements, you get a therapeutic dose of concentrated nutrients, that you just can't get from food. At GoodLife Provision we offer 15 potent supplements that support vision health. Just like you want to use the best quality eye makeup to make you look good on the outside, we can help your eyes feel and look good from the inside! Astaxanthin: Protects against age-related macular degeneration, eye strain, cataract, glaucoma and more. Powerful antioxidant! Pumpkin Seed Oil: Stabilizes macular degeneration, protects the retina. Excellent to support vision health. Resveratrol: Anti-aging, immune system enhancer. Prevents oxidative stress, protects against ocular diseases and degeneration. Don't share your eye makeup or borrow from a friend. You may be sharing harmful bacteria too.